It’s not properly a weeble despite it being Wednesday, but this sad little fishy has the same cartoonish, playful tone, I think. I decided to experiment a little with a medium I acquired some time ago and have never quite made peace with, watercolor crayons. I’m not sure if it’s the quality of the sets I’ve got or just the medium itself, but I’m never quite happy with the childlike texture that clings to the page even when I go in after and activate them with water. This fish wanted to be blue in honor of Dr. Seuss, so perhaps a cheery red fish will make it up sometime next week. 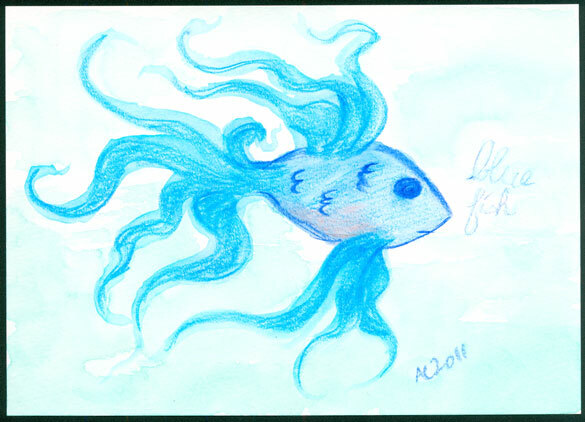 Blue Fish, 7″x5″ watercolor crayons on watercolor paper, not for sale.